Welcome to Terrific Tetanurae! 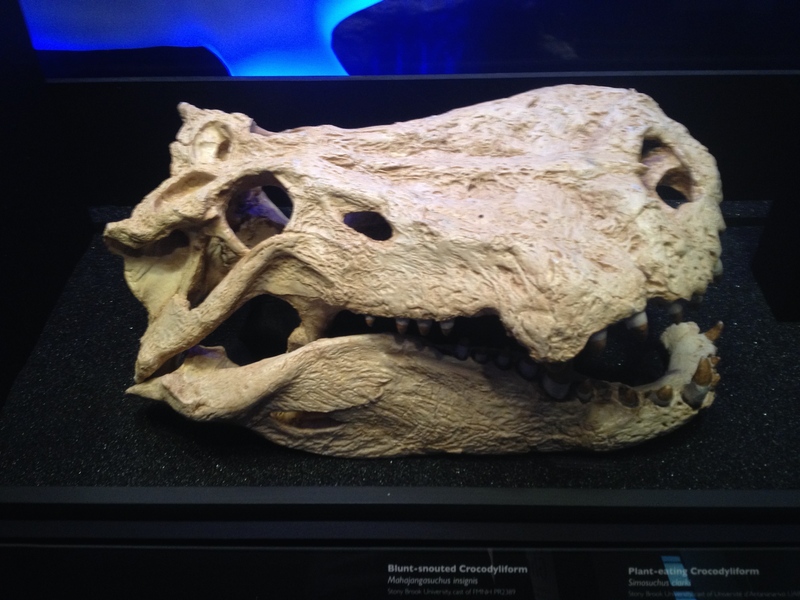 This post is part 3 of a series on the Giganotosaurini. It’s 118 million years ago in the Cretaceous of Argentina. A silent predator waits to kill its prey. The predator is Tyrannotitan chubutensis, the oldest known member of the Giganotosaurini. 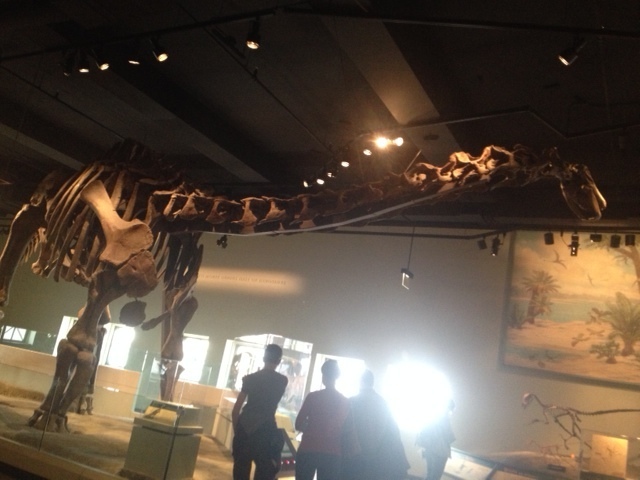 The prey is a lone sauropod. With a sudden strike, the theropod brings down the animal and starts its meal. Tyrannotitan is rather poorly documented, the first description of the animal a brief 4 pages. 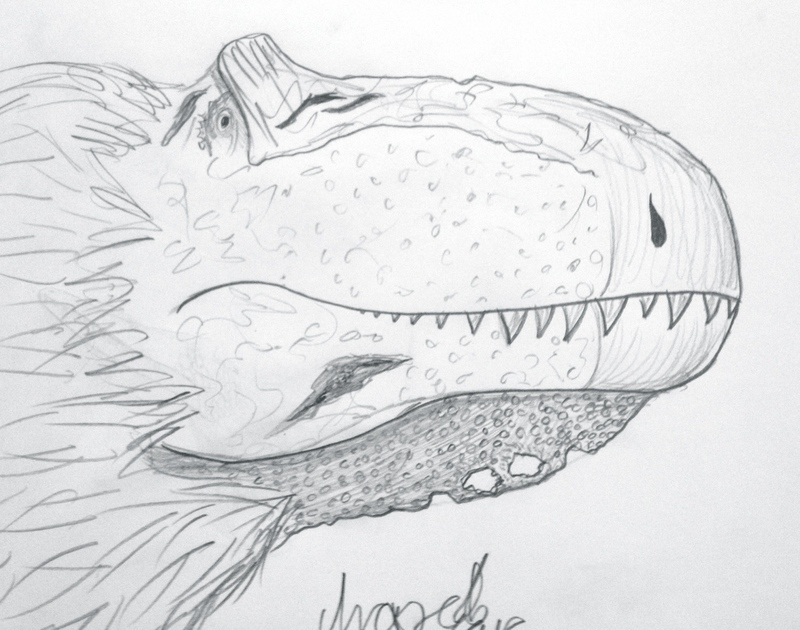 It has been found that Tyrannotitan is the most basal of Giganotosaurini, and also the second largest. This killer is estimated to have been around 41 feet long from snout to tail. The fossils of this beast were found in 2005 by Fernando Novas, Silvina de Valais, Pat Vickers-Rich and Tom Rich in Chubut Province, Argentina. The fossils belong to the Cerro Barcino Formation, which has also yielded the remains of the sauropod Chubutisaurus and the ceratosaurid Genyodectes. The presence of giganotosaurine carcharodontosaurids 118 million years ago greatly increases the time span in which the group lived on this planet. Unbeknownst to Tyrannotitan, future giganotosaurines, like Mapusaurus roseae, would come to dominate their ecosystems as top predators. Tyrannotitan was ahead of its time, its descendants becoming the last great lineage of the allosauroid dinosaurs. 1. Novas, F. E.; S. de Valais; P. Vickers-Rich; T. Rich .2005. “A large Cretaceous theropod from Patagonia, Argentina, and the evolution of carcharodontosaurids”. Naturwissenschaften 92 (5): 226–230. 2. Novas, Fernando E. .2013. “Evolution of the carnivorous dinosaurs during the Cretaceous: The evidence from Patagonia”. Cretaceous Research 45: 174–215. 3. Rey L. V.; Holtz, Jr T. R . .2007. Dinosaurs: the most complete, up-to-date encyclopedia for dinosaur lovers of all ages . United States of America: Random House. 4. Weishampel, David B; et al. .2004. “Dinosaur distribution (Early Cretaceous, South America).” In: Weishampel, David B.; Dodson, Peter; and Osmólska, Halszka (eds. ): The Dinosauria, 2nd, Berkeley: University of California Press. Pp. 563-570. 5. Rauhut, O.W.M. .2004. “Provenance and anatomy of Genyodectes serus, a large-toothed ceratosaur ( Dinosauria: Theropoda) from Patagonia”. Journal of Vertebrate Paleontology 24(4):894-902. Hello everyone! This is just a quick post! I hope you enjoy! Today I took a slight detour from my usual routine and drove to the Bruce Museum. The Bruce Museum is a medium-sized institution in Greenwich, Connecticut. It is a very beautiful museum and makes the most of its space. 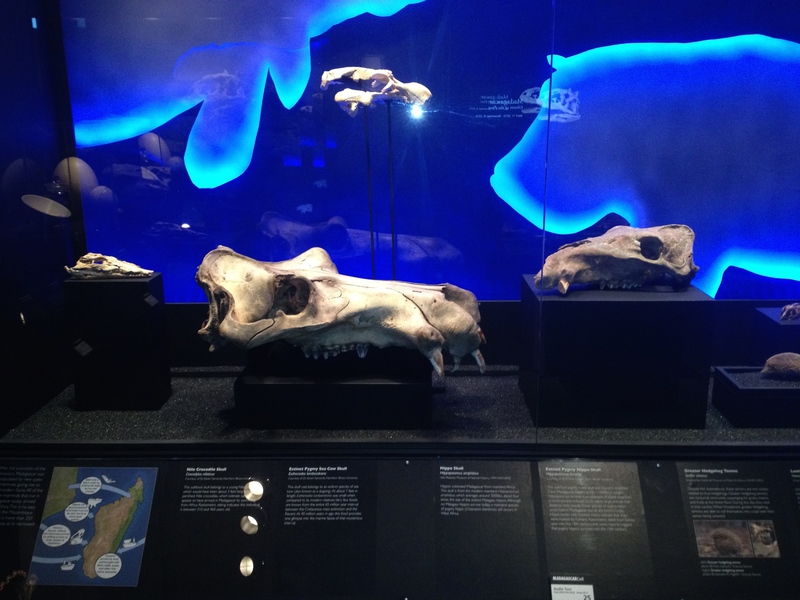 I was especially excited to head to the museum this time due to the fact that their new exhibition: Madagascar: ghosts of the past, which features casts of some amazing fossil specimens from the island, has just opened. The museum lobby is a gorgeous space with a very modern feel to it. 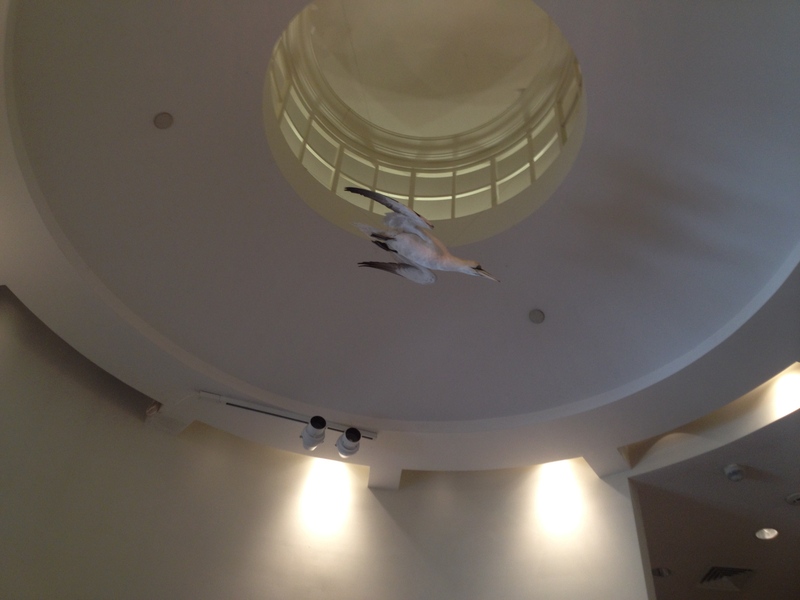 A gannet in a diving position is centered in the middle of the dome ceiling. The Gannet in the main Lobby. Photo by the author, 2015. 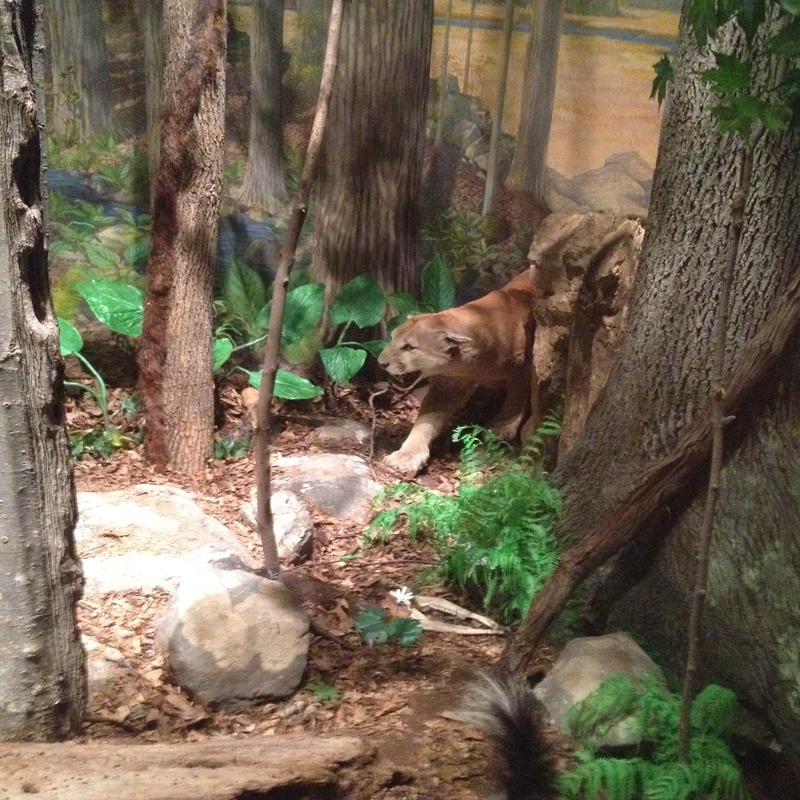 My first stop was the exhibit Changes in Our Land, which displays a wide variety of taxidermy animals native to the Northeast US as well as other local and non-local specimens. The opening display of Changes in Our Land. Photo by the author, 2015. The next room is the Geology hall, which features a menagerie of geological specimens, most of which are from the northeast. 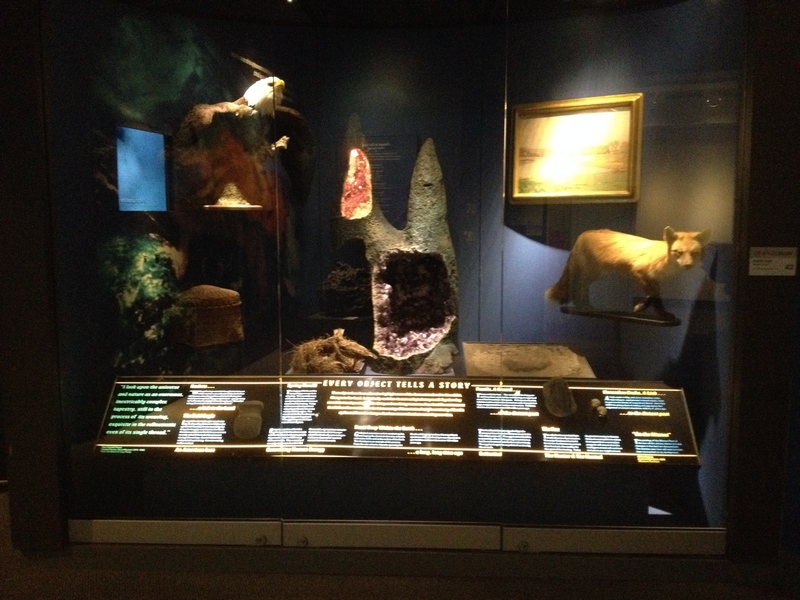 Tucked away in one of the corners of the exhibit is the florescent mineral room, which has some interactive features. The rocky wall surface is a great touch and really makes the exhibit more immersive. 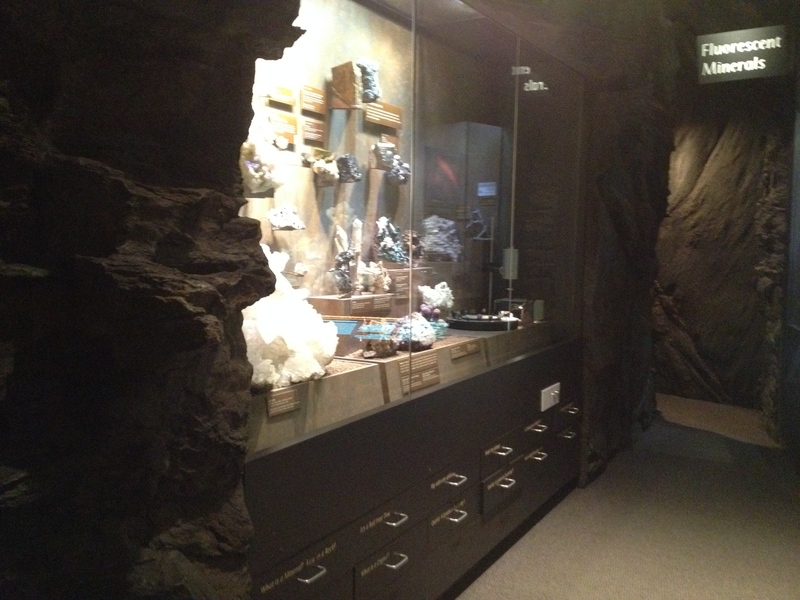 The first corridor of the Geology hall, with the Florescent mineral room in the back. Photo by the author, 2015. 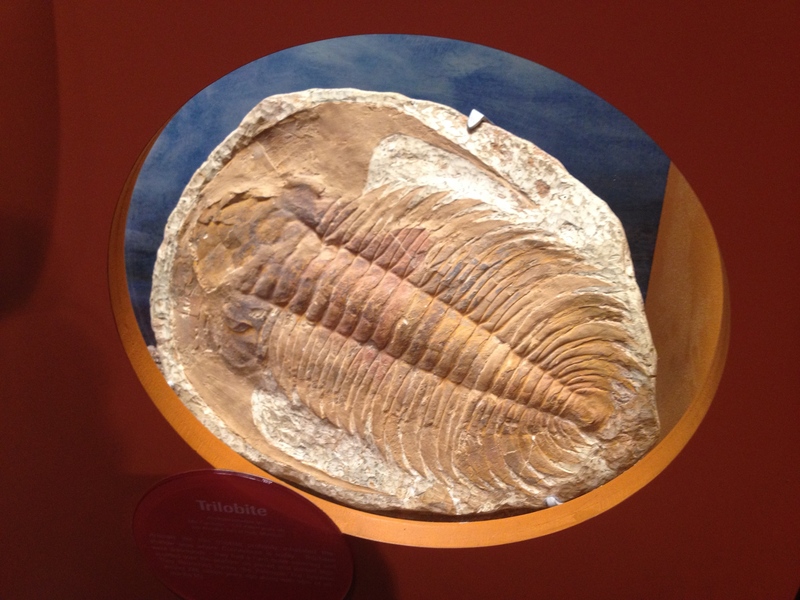 A trilobite also makes an appearance. Photo by the author, 2015. And so does a Mesosaurus. Photo by the author, 2015. … and a Brontothere. Photo by the author, 2015. 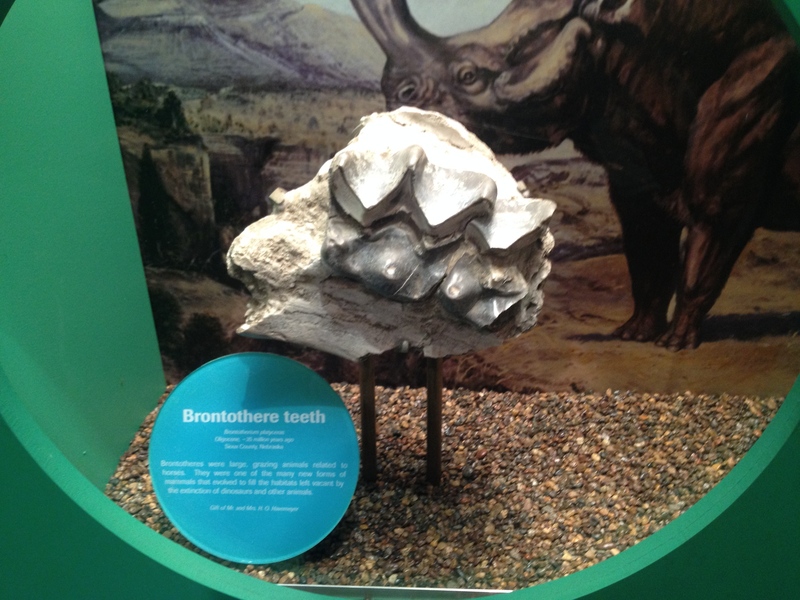 And a Mammoth… tooth. Photo by the author, 2015. 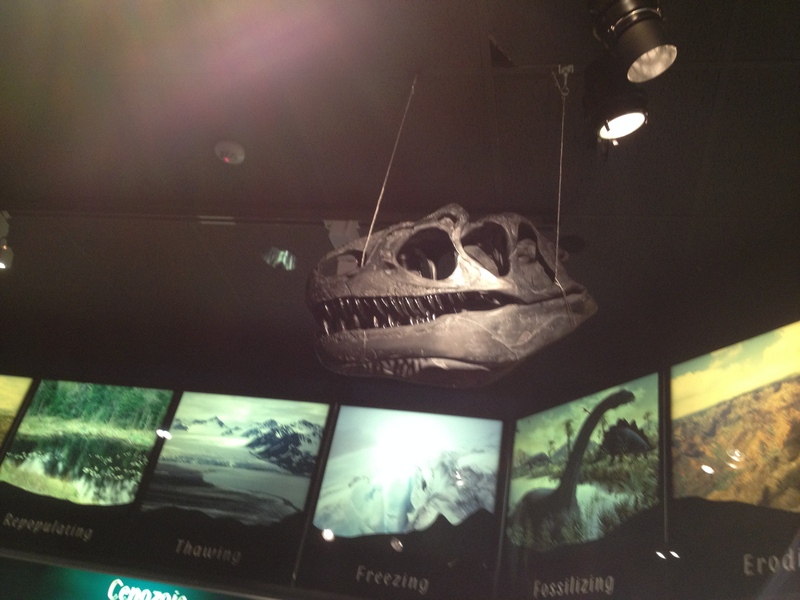 An Allosaurus skull also hangs from the ceiling. 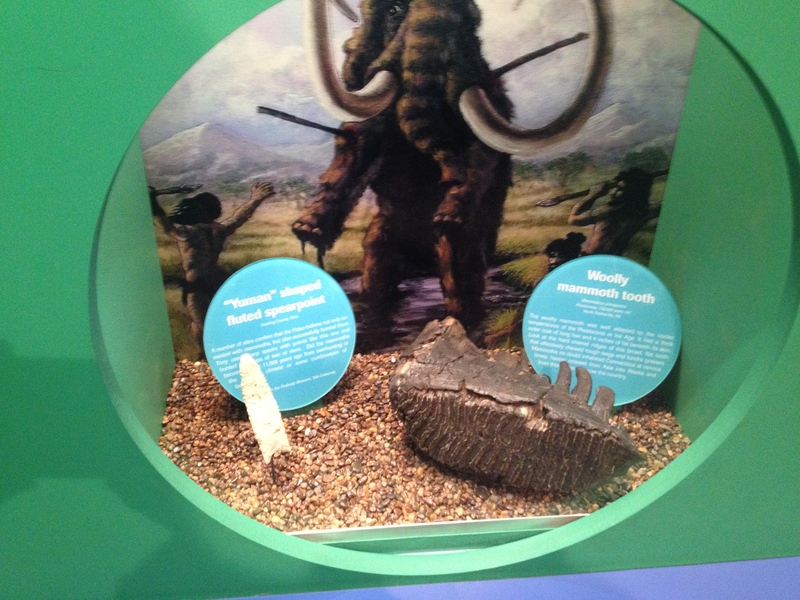 It’s a nice touch to what otherwise would be an exhibit full of only rather small fossils. 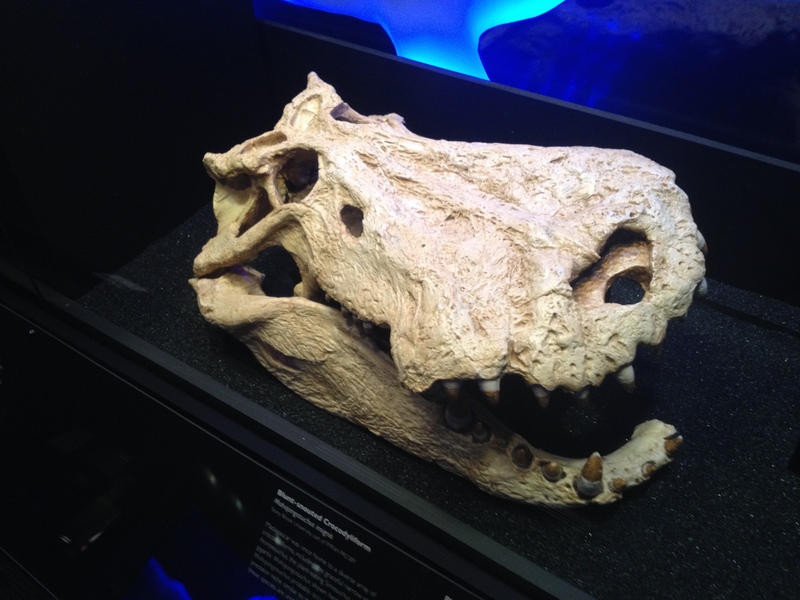 It also brings to the exhibit the essence of a ‘dinosaur museum’, which always makes the visit more fun. The Flying Allosaurus fragilis head. Photo by the author, 2015. After that, a hallway with taxidermy animals on one side and the life-sized cross-section of a Native American tipi on the other greets you. The tipi is accompanied by a glass container full of Native American artifacts. The hallway. Photo by the author, 2015. Then there’s the animal hall. This showcases a wide variety of taxidermy specimens ranging from birds to bugs. Most of the species exhibited are native to the Northeast, which adds to the local museum feel. On the sidelines there is a diorama of what a Connecticut forest would have look like a few thousand years ago. The right wall of the taxidermy, erm, animal hall. Photo by the author, 2015. The Connecticut forest diorama. Photo by the author, 2015. Connecticut forest diorama detail. Photo by the author, 2015. Majungasaurus crenatissimus. Photo by the author, 2015. Mahajangasuchus insignis. Photo by the author, 2015. 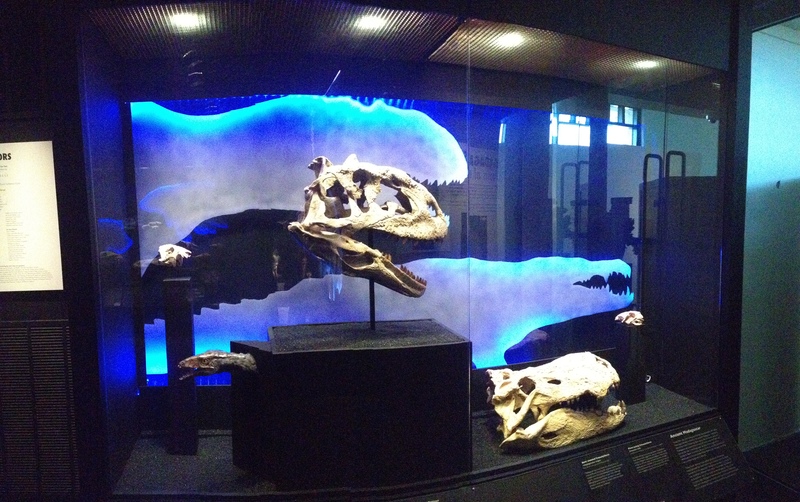 Another view of the Mahajungasuchus skull. Photo by the author, 2015. The Cretaceous Madagascar display. Photo by the author, 2015. The skull of Vintana sertichi. Photo by the author, 2015. 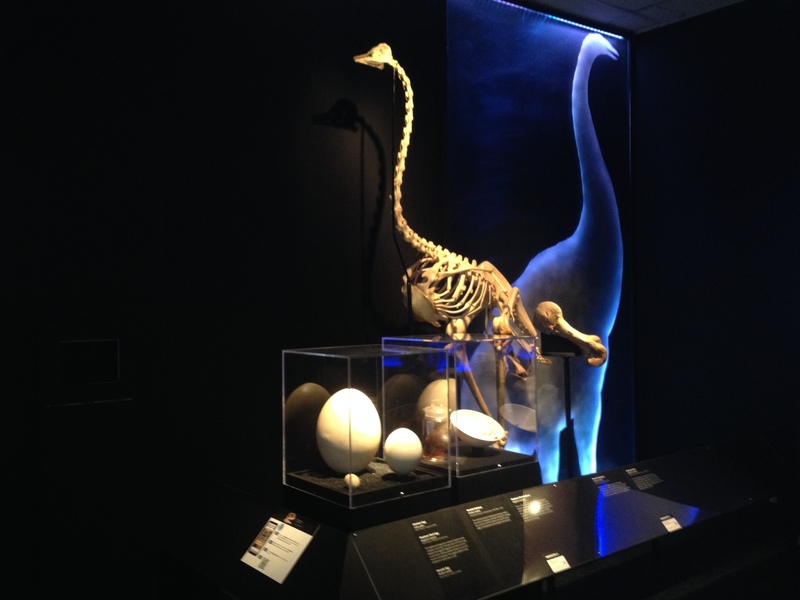 The Aepyornis/Struthio exhibit. Photo by the author, 2015. 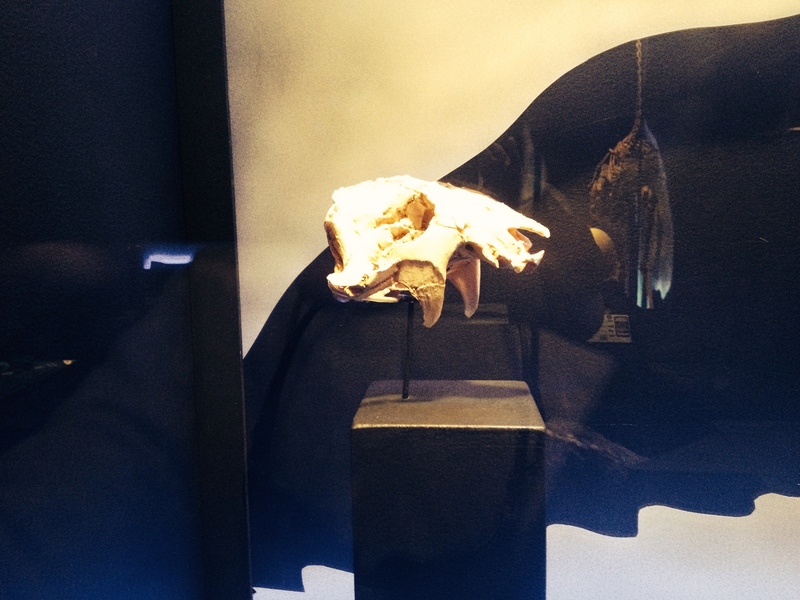 The extinct Malagasy mammal exhibit. Photo by the author, 2015. 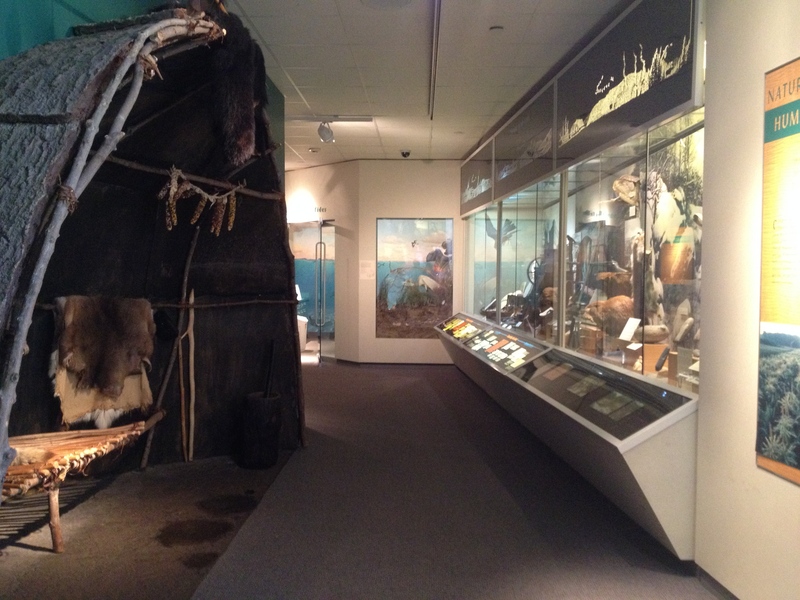 A panoramic view of the exhibit. Photo by the author, 2015. Wow! We have hit the big 1-0! Time to celebrate with tons of news! Brontosaurus is back! A new paper published in the journal PeerJ by Tschopp et. al. revisits the entire clade Diplodocoidea in a specimen-level analysis. They have also renamed “Diplodocus” hayi Galeamopus hayi. Two other species of Apatosaurus have also been attributed to Brontosaurus. These are A. parvus and A. yahnahpin. Tschopp et al. found that AMNH 460 might not even be an Apatosaurus and that FMNH 25112 might not even be an apatosaurine. We don’t know what this guy is anymore. AMNH 460. Photo by the author, 2015. I… I don’t know anymore! FMNH 25112. Photo by the author, 2014. Although I would argue that Tschopp et. al. did not factor in species-level phenotypic variation as much as they should have in their taxonomic assessments, the paper stands as a well-done review and description of the diplodocoid sauropodomorphs. I highly suggest you read the paper here, and good job to the guys who wrote it! 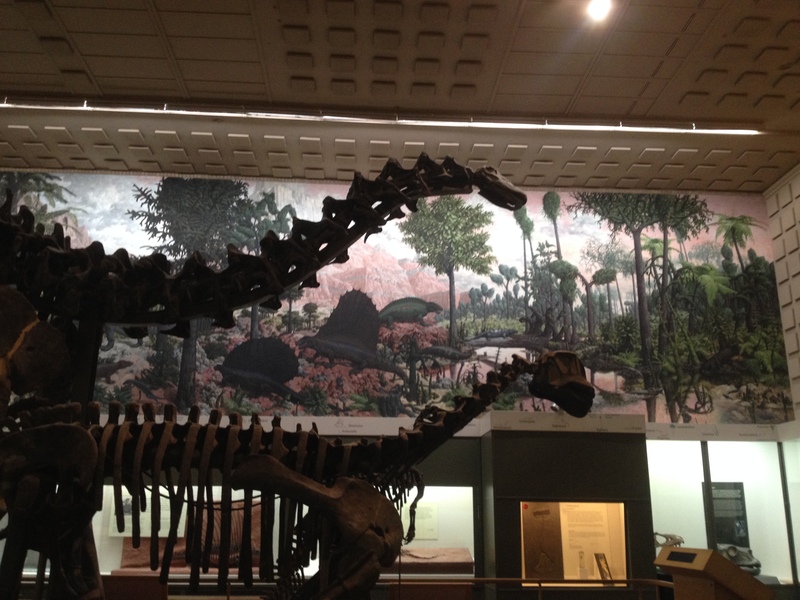 The neck of the Brontosaurus excelsus mount at the Yale Peabody Museum. Photo by the author, 2014. The Project Daspletosaurus paper has been released! Dave Hone and Darren Tanke have had their findings on combat and cannibalism among tyrannosaurs published in the journal PeerJ. This detailed work showcases the battered skull of an adolescent Daspletosaurus. You can go check out the paper here. 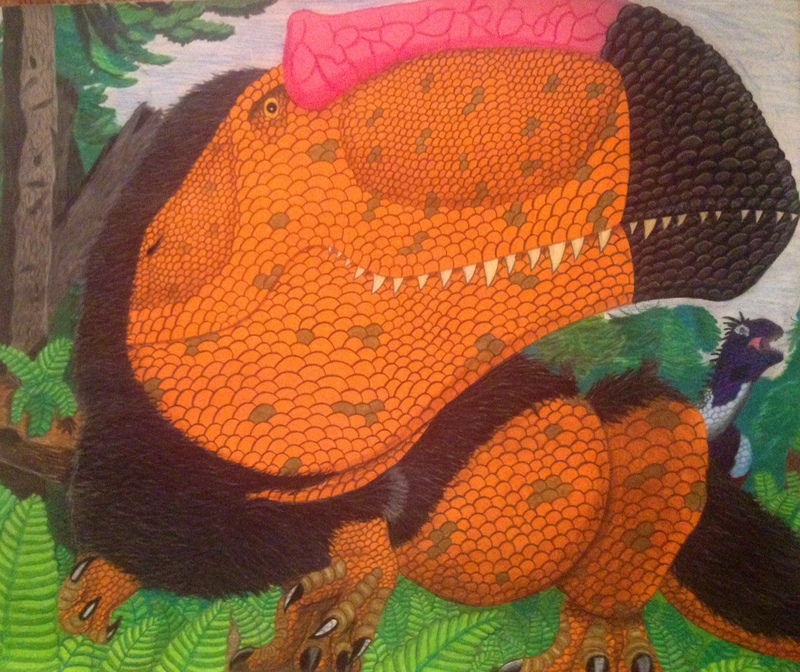 A battle-damaged Daspletosaurus by the author. pencils on paper, 2015. A new phorusracid has been described! The type specimen of Llallawavis scagliai is the most complete phorusracid specimen yet found. The skeleton has an exceptionally well-preserved skull, and the trachea, voice box, and auditory region of the skull are all preserved. This has allowed researchers to estimate the frequency range of terror birds like L. scagliai could hear, which has implications for research into communication among these immense birds. Llallawavis scagliai by the author. Colored pencils on paper, 2015. Specimens from the Yale Peabody Museum indicate that mosasaurs gave live birth at sea. The paper, which was released in the journal Palaeontology on April 10, describes the youngest mosasaur specimens ever found. Originally thought to be fossils of prehistoric marine birds, these fossils give us further insight into the ontogeny of mosasaurs. At SVPOW!, Mike Taylor shares some thoughts on Tschopp et. al., 2015 and Matthew Wedel considers how to make the results of scientific research more accessible. You can find those posts here and here. 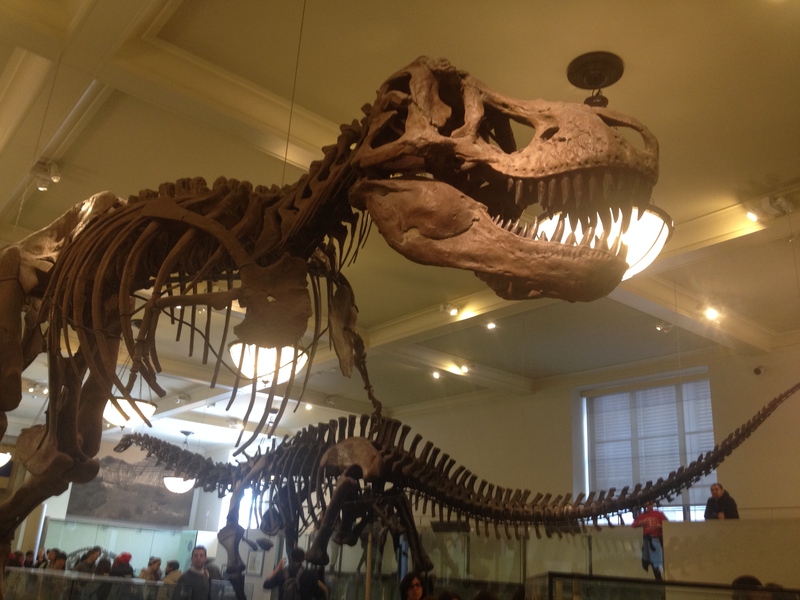 Dave Hone talks about his paper on combat and cannibalism among tyrannosaurs (see above) on his blog Archosaur Musings. Here is the link. Prehistoric Beast of the Week has arrived! Born out of the beloved blog Jersey Boys Hunt Dinosaurs, Christopher DiPiazza, Nathan Vranken and Eric Warren have teamed up to make this awesome new addition to the Dinoblogosphere. You can find the blog here. At LITC, David Orr interviews artist Angela Connor. Go check that post out here! I know I have mentioned this before, but David and his wife Jennie are in the midst of the funding campaign for their book, Mammoth is Mopey. If it is published, it will be a great educational resource for young children interested in paleontology. To see what you can do to help, go to their Indiegogo page here. At his blog, Mark Witton talks about the weird Triassic reptile Sharovipteryx. You can find that post here. 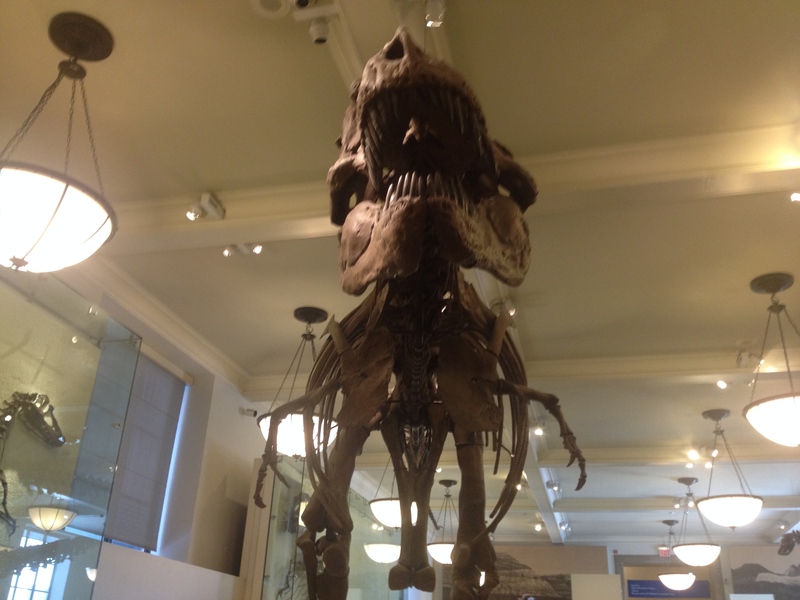 Tyrannosaurus rex at the AMNH. Photo by the author, 2015. 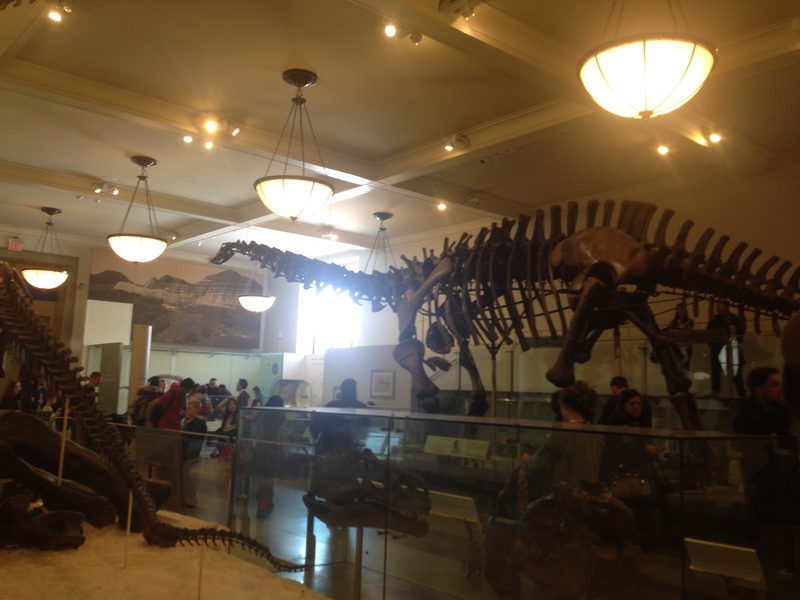 The classic AMNH Hall of Saurischian Dinosaurs image. Tyrannosaurus in foreground and an unidentified apatosaurine in the back. Photo by the author, 2015. 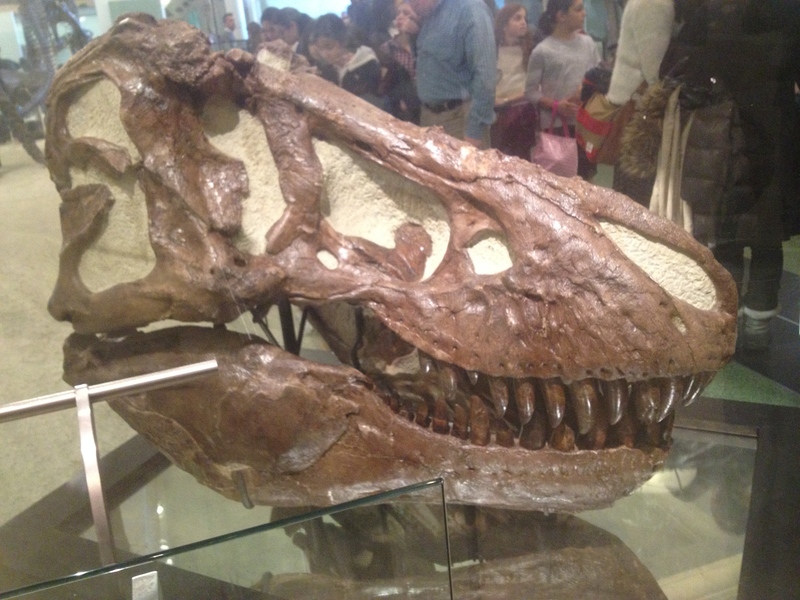 The skull of the famous AMNH Tyrannosaurus. Photo by the author, 2015. I hope you enjoyed PaleoNews #10! Thanks for reading!! This is part 2 of a series on the Giganotosaurini. For part one, click here. During the Cretaceous, the biodiversity of the clade of theropods known as Tetanurae skyrocketed, with new families, such as the dromaeosaurids, becoming very successful. The Cretaceous period was also a time of giant herbivorous dinosaurs, many which were preyed upon by some of the most amazing killers in all of Earth’s history. Among these predators were the carcharodontosaurids, a diverse group of big-bodied, large-skulled allosauroids. The carcharodontosaurids reached their apex in Giganotosaurus , a highly derived taxon from the Cenomanian stage of the Cretaceous of Argentina. Giganotosaurus was a huge predator, with size estimates placing it at around 41-45 feet in length and at around 6.5-13.8 tons in weight. 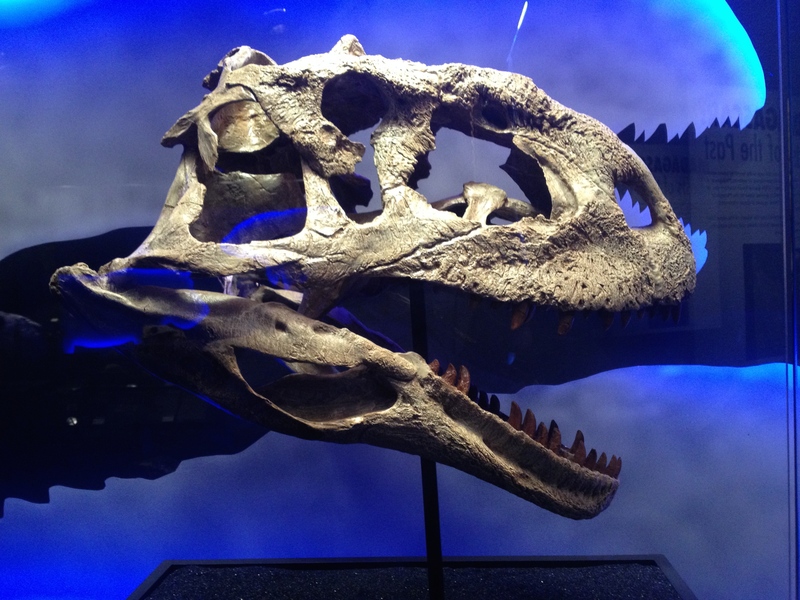 Only 2 specimens of Giganotosaurus are known, and both have been attributed to G. carolinii. The holotype of G. carolinni is around 70% complete and was described in 1995 by Rodolfo Coria and Leonardo Salgado in 1995. A second specimen which consists of a partial lower jaw was attributed to G. carolinii by Jorge Calvo and Rodolfo Coria in 1998. This specimen may have come from an individual 8% larger then the holotype, but then again, the individual this specimen belonged to may have just had a deeper dentary. At the time of its discovery, Giganotosaurus carolinii was considered to be the largest land predator ever, but more recent analyses place the holotype at around the same length as the largest Tyrannosaurus rex specimen, Sue. Scott Hartman’s analysis placed the mass of the holotype of G. carolinii at slightly less then the mass of Sue, but he also stated, “To be fair, there’s only one good specimen of Giganotosaurus, and it took most of a century to find Sue, so it’s certainly possible that as additional specimens are collected we will find larger southern giants. As always, please remember we don’t have a statistically valid population of specimens from any of these large dinosaurs, so we are only comparing individuals, not species.” Nevertheless, G. carolinii was a huge predator and definitely would have been one of the main predators in its ecosystem, and the second specimen may indicate that some individuals of Giganotosaurus could achieve masses larger then those of the largest Tyrannosaurus. For more on the ecosystem in which Giganotosaurus lived, go here. Giganotosaurus (foreground) rests in the antediluvian plains of the Candeleros Formation while Andesaurus browses in the background. Colored pencils on paper, 2015. Sorry T. rex, you may have been dethroned! 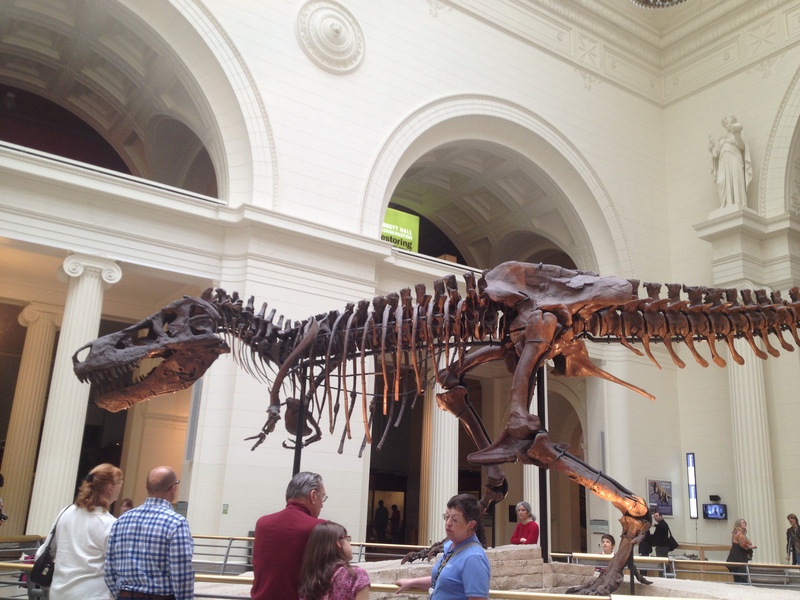 Sue the Tyrannosaurus rex. Photo by the author, 2014. I hope you enjoyed the article, and thanks for reading! 1. Coria, R.A. and Currie, P.J. .2002. “Braincase of Giganotosaurus carolinii (Dinosauria: Theropoda) from the Upper Cretaceous of Argentina.” Journal of Vertebrate Paleontology 22(4): 802-811. 2. “Mass estimates: North vs South redux” Scott Hartman. Scott Hartman’s Skeletal Drawing. com. October 26, 2013. 4. Calvo, J.O. and Coria, R.A. .1998. “New specimen of Giganotosaurus carolinii (Coria & Salgado, 1995), supports it as the largest theropod ever found.” Gaia 15: 117–122. 5. Coria, R.A. & Salgado, L. .1995. “A new giant carnivorous dinosaur from the Cretaceous of Patagonia.” Nature 377: 225-226. 6. Coria, R.A. and Currie, P.J. .2006. “A new carcharodontosaurid (Dinosauria, Theropoda) from the Upper Cretaceous of Argentina.” Geodiversitas 28(1): 71-118. 7. Holtz, Thomas R. Jr. .2012. “Dinosaurs: The Most Complete, Up-to-Date Encyclopedia for Dinosaur Lovers of All Ages” Appendix. 8. Seebacher, F. .2001. “A new method to calculate allometric length-mass relationships of dinosaurs”. Journal of Vertebrate Paleontology 21 (1): 51–60. 9. Therrien, F.; Henderson, D.M. .2007. “My theropod is bigger than yours…or not: estimating body size from skull length in theropods”. Journal of Vertebrate Paleontology 27 (1): 108–115. 10. Novas, F. E.; Agnolín, F. L.; Ezcurra, M. N. D.; Porfiri, J.; Canale, J. I. .2013. “Evolution of the carnivorous dinosaurs during the Cretaceous: The evidence from Patagonia”. Cretaceous Research 45: 174. Hey guys, welcome to PaleoNews #9! The first species of Metoposaurus found in the Iberian Peninsula has been described. At 6 feet long, this animal was one of the main aquatic predators in its ecosystem. This new species is known from a bonebed of animals found in a lacustrine deposit in Portugal which date to around 230 million years ago. 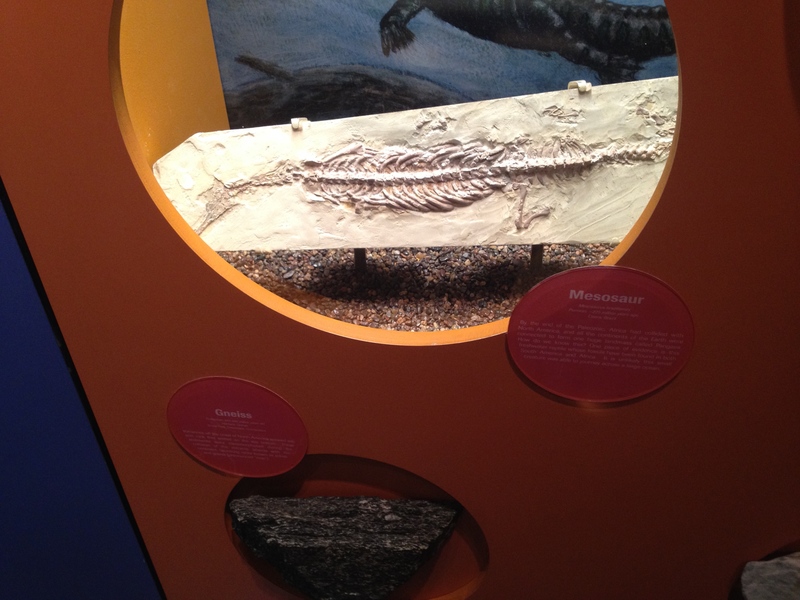 Metoposaurus was a highly derived temnospondyl. Called “toilet head” by some in the media, the use of the flat skull of the animal is still unknown. I suspect it acted like a spring trap, snapping shut when a prey item crossed paths with this predator. Another strange stem-arthropod has been discovered. Around 508 million years ago, Yawunik kootenayi swam through the primordial seas of the Cambrian. Part of the Burgess Shale fauna, Yawunik shares many features with modern arthropods, including long appendages jutting out from the front of the animal that are similar to antennae. These appendages sported rows of “teeth” which were used to hunt prey items. In fact, the frontal appendages of this animal are some of the most complex known among all arthropods. At DINOSOURS!, Ben starts a new series on the AMNH fossil halls. You can find part 1 here and part 2 here. 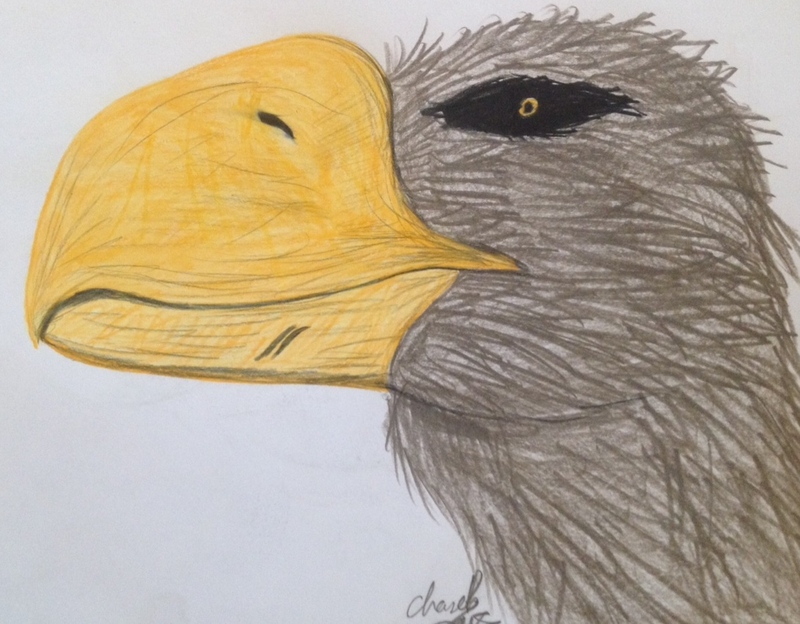 Theropod Thursday 53 has been posted on dinosaurpalaeo! Join Heinrich as he explores the world of snow-white birds in Theropod Thursday 53: Snow White. The Royal Tyrell Museum takes us into the lives of the many museum staff who help excavate, prepare, and mount their fossils. It’s really quite interesting! I suggest that you check the post out here. Mammoth is Mopey needs your help to be published! David Orr of LITC and his wife are trying to publish their book Mammoth is Mopey! The book will help educate both child and adult as they read through an alphabet of prehistoric animals while also getting little factoids on various prehistoric animals. It also features animals littlle known to the public, such as Opabinia and Kelenken. To see what you can do to help get this book published, you can visit David Orr’s blog at chasmosaurs.blogspot.com and the book’s Indiegogo page here. Jason is an amazing artist as well as an accomplished academic! His art has been featured in various media outlets including Prehistoric Times. You can find him at his blog dinosaursandbarbarians.wordpress.com. Thanks again to Jason for allowing me to use his artwork! I hope you all enjoyed PaleoNews #9! Thanks for reading!